The Annual General Meeting approves the accounts for 2017, in which the Group made a net profit of 701 million euros. The company assigns 447 million euros to dividends. Commitment to equality: women now represent 39 percent of management job positions within the company, and 27 percent of the members of the Board of Directors. Rollout of MAPFRE Open Innovation: this is a new innovation model featuring a startup accelerator and an investment vehicle, among other initiatives. The company launches Te Cuidamos Accionista, a program offering the same value added services enjoyed by clients to shareholders. 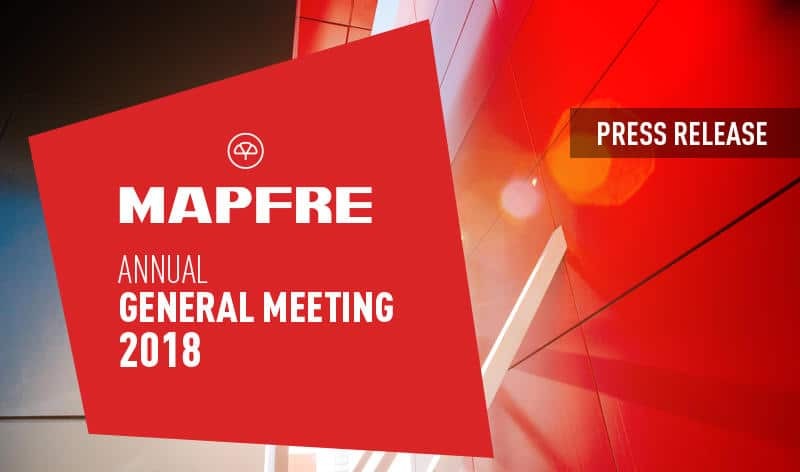 The MAPFRE Annual General Meeting, held today in Madrid, approved the company’s accounts for the 2017 financial year, in which the Group made a net profit of 701 million euros. Furthermore, a dividend in the amount of 0.145 euros per share was approved against the results for 2017, giving a yield of 4.9 percent at the average share price for 2017. As such, MAPFRE will pay shareholders 447 million euros against the results for the 2017 financial year, assigning 63.7 percent of profits to dividends, in compliance with the commitment to maintaining a payout of between 50 and 65 percent. Antonio Huertas, Catalina Miñarro and Pilar Perales were also reelected as directors. During the meeting, the chairman and CEO of MAPFRE, Antonio Huertas, outlined the strategic plan for 2016-2018, declaring its execution and the degree of compliance with the commitments undertaken as “positive”, highlighting some of the initiatives developed. For example, as far as digital transformation is concerned, more than 200 projects were executed that have contributed to digitizing interaction with the company. He also pointed out that MAPFRE will continue its efforts to obtain the best possible ROE in 2018, and it is maintaining its objective of offering a payout of between 50 and 65 percent. During the meeting it was also announced that company shareholders will have access to the same added-value services as those available to clients, via the Te Cuidamos Accionista program, thus strengthening MAPFRE’s commitment to this group. Antonio Huertas also reaffirmed that the objective of continuing to beat the market in most of the countries where the Group operates remained in force. With regard to this, he declared that in the last twelve months, the Group achieved an increase in market share in half of the countries it operates in, (as against a three-year objective of 75 percent of countries). As for client experience, the company had already analyzed client evaluations for 79 percent of the Group’s businesses (as against the 80 percent envisaged for the three-year period), and exceeded the average rating for the market in 65 percent of cases. In the last two years, MAPFRE has saved 114 million euros as a result of its cost-cutting plan, with the ratio standing at 27.5 percent at the close of 2017, (as against an average objective of 28 percent for the three-year period). Furthermore, MAPFRE has been recognized as a Best Workplace in 9 countries. In addition, 39 percent of management job positions are already held by women (as against the objective of 40 percent for the three-year period). As for the three-year objective of having a workforce with 2 percent of people with disabilities, the chairman and CEO announced that the Group had already surpassed this, having reached 2.1 percent. In the strategic analysis undertaken by MAPFRE, a new innovation model was also presented, which will strengthen the company against new business models entering the market, increase its efficiency and accelerate cultural change within the organization. The model will include other elements such as a startup accelerator and an investment vehicle. These instruments will facilitate the search for disruptive solutions to the requirements arising in the insurance market, especially those related to automobiles, homeowners and health. This new project will be implemented by means of a series of innovation and transformation platforms (MAPFRE Open Innovation), comprising the current model for strategic innovation together with disruptive innovation. It will be governed by a Transformation and Innovation committee, which will report directly to the executive committee and which will be led by the MAPFRE chairman and CEO. “The aim of this model is to continue innovating in all those areas that will help us to become a more agile company, more progressive and more efficient, without losing our focus on the two main motors of our activity: the client and the profitability of the business”, declared Antonio Huertas, the chairman and CEO of MAPFRE, during the Annual General Meeting.